For her part as a From the Ground Up Field Trip Leader, artist and writer Kari Marboe delved into the history of two Oakland quarries and the lives of their namesakes: Frank W. Bilger and Anson S. Blake. 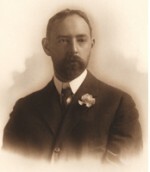 Frank W. was born in Oregon in 1868, graduating from the UC Berkeley department of pharmacy in 1889. 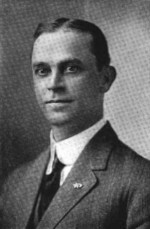 Bilger worked for the Oakland Paving Company and then the Blake & Bilger Company as secretary, treasurer and main owner of both. Bilger’s quarry was mined for Franciscan sandstone, an extremely uniform rock in this spot. Mining consisted of drilling 18’ holes into the ground and steam hoisting rock out to be crushed. The quarry averaged about 250 cubic yards of crushed rock daily, a volume equivalent to two average backyard swimming pools. 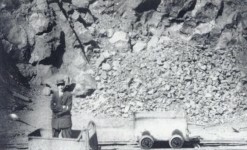 All of the crushed rock was sent by railway to a depot on 41st and Shafter, where it could then travel easily by train other locations within Oakland and beyond. Quarrying operations ceased in the 1930s and the excavated area was used as a reservoir for watering the adjacent country club’s golf course. 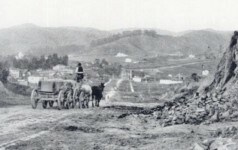 The majority of Oakland’s roads and sidewalks are made out Franciscan sandstone and Bilger is considered a pioneer road builder of Oakland. His life wasn’t all rocks and roads. Bilger was the tenth life member of the Society of American Magicians, an order whose chief object is the prevention of exposure of the tricks by which public entertainers in this field earn their living and whose efforts have done a great deal toward keeping the mysteries of the art among the fascinations of the stage. Anson S. was born in San Francisco in 1870, the son of a gold rush pioneer. Like Bilger, he studied at UC Berkeley. He took over his father’s Oakland Paving Company and with Frank Bilger started the Blake & Bilger Company in 1905. Blake Quarry, also a source of Franciscan sandstone, is now Piedmont’s Dracena Park. 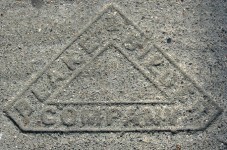 Both the Oakland Paving Company and Blake & Bilger Company relied on the Blake Crusher, a machine invented by Anson’s grandfather Eli Blake in 1858. Prior to this, workers crushed the stones used to build roads by hand, with hammers.